When Prosecco‑loving Auntie Poldi retired to Sicily from Germany, she never dreamed her tranquil days would be interrupted by murder. But Sicily had other plans, and Poldi found herself honor‑bound to solve the disappearance of her beloved (and cute) handyman. Now she’s finally ready for some peace and quiet—interrupted by romantic encounters with handsome Chief Inspector Montana, of course—when the water supply to her neighborhood is cut off and a dear friend’s dog is poisoned, telltale signs that a certain familial organization is flexing its muscles. Poldi knows there will be no resolution without her help. She soon finds a body in a vineyard, tangles with the Mafia, and yet again makes herself unpopular in the pursuit of justice. But once wine and murder mix, how could she possibly stay away? MARIO GIORDANO, the son of Italian immigrants, was born in Munich. 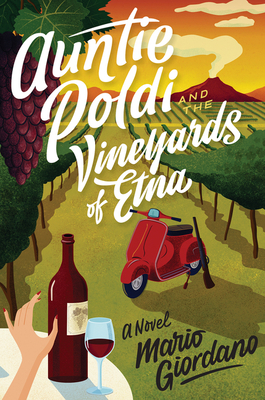 Auntie Poldi and the Sicilian Lions, his first novel translated into English, was an IndieNext Pick, a B&N Discover Selection, an Amazon Top Ten Best Book of the Month, and a Costco Staff Pick. He lives in Berlin. John Brownjohn lives in Dorset in the UK. His work has won him critical acclaim and numerous awards on both sides of the Atlantic, including the Schlegel-Tieck Prize (three times), the PEN American Center's Goethe House Prize, and the Helen and Kurt Wolff Prize for Marcel Beyer's The Karnau Tapes and Thomas Brussig's Heroes Like Us.